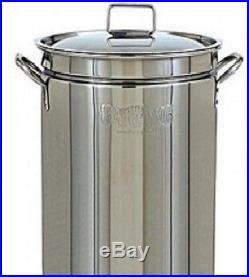 Fryer Steamer Stainless Steel Indoor Outdoor 36-Qt. Turkey Bayou Classic US Made. Will compliment any true outdoorsman’s personality. This pot is durable, reliable, and versatile. Use it to boil seafood, clams and vegetables. Cook soups, stews, gumbo, jambalaya, and low country boil. Perfect pot to boil peanuts and home brew beer. 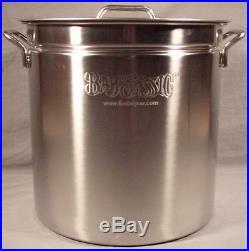 36-quart stainless stockpot 13.5 by 15 inches. 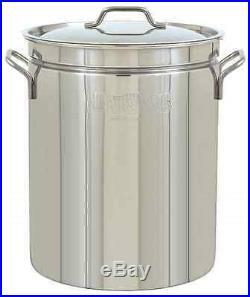 Stockpot: 0.8mm / 20 gauge. And also to over. Many many countries worldwide. At times may use a third party supplier to fulfill your order. We always want you to get the exact product you ordered in the time frame we promised you. Every order placed also provides for a small donation to our Veterans. It is very important to us that we put. We consider it a top priority that our customers are happy and in the rare event that they are not, we do everything we can to fix the situation. No customer should ever walk away from our store unhappy. If there’s a problem, just let us know and we will fix it. We guarantee you only the best experience when shopping in our little store! Thank you again for shopping with us. The item “Fryer Steamer Stainless Steel Indoor Outdoor 36-Qt. Turkey Bayou Classic US Made” is in sale since Thursday, May 18, 2017. This item is in the category “Home & Garden\Kitchen, Dining & Bar\Small Kitchen Appliances\Deep Fryers”. The seller is “lonewolf92c” and is located in Dallas, Texas. This item can be shipped to United States, Canada, Denmark, Romania, Slovakia, Bulgaria, Czech republic, Finland, Hungary, Latvia, Lithuania, Malta, Estonia, Australia, Greece, Portugal, Cyprus, Slovenia, Japan, China, Sweden, South Korea, Indonesia, Taiwan, South africa, Thailand, Belgium, France, Hong Kong, Ireland, Netherlands, Poland, Spain, Italy, Germany, Austria, Russian federation, Israel, Mexico, New Zealand, Philippines, Singapore, Switzerland, Norway, Saudi arabia, Ukraine, United arab emirates, Qatar, Kuwait, Bahrain, Croatia, Malaysia, Brazil, Chile, Colombia, Costa rica, Dominican republic, Panama, Trinidad and tobago, Guatemala, El salvador, Honduras, Jamaica.